“Eat food. Not too much. Mostly plants.” This is the premise of Michael Pollen’s book, In Defense of Food: An Eater’s Manifesto. The book, which grew out of an essay that Pollan wrote for The New York Times Magazine, challenges some of the major concepts of nutrition. Pollen puts forth the idea that food is more than the sum of its parts or its composition of individual nutrients. He claims that we don’t need to rely on nutrition experts to tell us what to eat and instead he encourages a back-to-basics approach and a return to traditional ways of eating. Pollen brings our attention to the American paradox: “a notably unhealthy population preoccupied with nutrition and diet and the idea of eating healthfully”. He says that as long as we are eating a Western diet it will be impossible to overcome this situation and his recommendation is a return to local, seasonal foods and traditional dietary patterns. He advises us to avoid any foods that our great-grandmothers wouldn’t recognize and to regard fruit and vegetables as the foundation of our diets.. He recommends that we avoid supermarkets and instead source out local farmers and preferably buy everything organic. Pollen also says that we should spend more on food because if we buy better quality, but more expensive produce, we will improve our health and that by eating less, we can make up for the financial difference. In Defense of Food encourages us to prepare meals at home instead of eating fast food because this will help to bring back the idea of the traditional family meal. Pollen highlights the important function of sharing a meal in regard to fostering better communication and social connections that also have positive effects on our general health. Pollen does offer some basic dietary recommendations. He advises dieters to consume three meals a day, eat smaller portions, emphasize vegetables, increase the intake of whole foods and avoid snacking. Additionally meat should be regarded more as a side dish rather than the main part of the meal. Fruit, vegetables, wild greens such as purslane and lamb’s quarters, whole grains, nuts, seeds, grass-fed beef, salmon, sardines, red wine. In Defense of Food does not include meal suggestions or a meal plan. Gardening is the recommended form of exercise because it helps us connect with nature and the food that we eat. 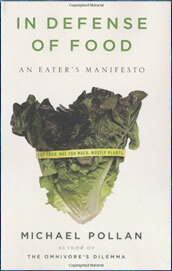 In Defense of Food: An Eater’s Manifesto retails at $15. Encourages a diet based on unprocessed whole foods. Advocates seasonal eating and local produce. Increases awareness of food choices and eating habits. Encourages eating at home and enjoying the pleasures of food. Discusses the benefits of portion control. Highlights the importance of essential omega 3 fats. May be expensive to buy fresh organic foods all the time. Some dieters may not relate to the political themes throughout the book. May be perceived as an elitist approach. In Defense of Food explores concepts relating to health, politics and culture and makes the point that we don’t need to rely on science in order to decide what we should eat. Michael Pollen encourages us to return to a natural plant-based diet and to mirror the lifestyle habits of healthy people around the world who thrive on traditional diets. This is a very informative book and gives a good defense on why we should eat organic. I don’t consider this to be a diet book though. Won’t help you lose weight but will help you eat healthily.